Recorded live at The Royal Albert All, London. 1990 & 1991. Love this album! Badge is great and White Room is one of EC's best live vocal performances I've heard. Jamming on Sunshine of Your Love is good. So is Have You Ever Loved A Woman. Love listening to Old Love - even if it is thirteen minutes long! Edge of Darkness is one of my favourites and it sounds amazing with the orchestra. The whole CD has great sound quality. A must for every Clapton fan. This album was the cleanest sounding thing I have ever heard. the solo on "White Room" is absolutely perfect. I love this CD "Badge" has a good solo "White Room" great "Sunshine Of Your Love" ok drum solo "Old Love" outstanding and "Edge Of Darkness" good outro solo A must have for any Clapton fan. This Live CD shows how brilliant a guitarist he is live. It captures him at probably his best period ever. "Running on Faith" is the epitome of Eric Clapton and his soul. This has become one of my favourite EC songs. Another song on this CD that haunts me is the version he does of "Wonderful Tonight. I love the way he slows the song down and pours his soul out with a guitar solo that will give you goose bumps, as Katie Kassoon swoons at the end, this is nothing short of brilliant, The Blues songs with Robert Cray and Johnnie Johnson are great. The highlight being "Worried life Blues", "Old Love" again makes you want to cry as the Stratocaster screams into the night. "Hard Times the old Ray Charles song is also outstanding. As is Have you ever loved a woman the Dominoes classic. Bell Bottom Blues another Dominoes classic is worth checking out. Pretending and Bad Love are also worth the listen. White Room is powerful, Sunshine of your Love the Cream standard almost makes you wish Jack Bruce and Ginger Baker were on stage with Clapton. The solo has a definite 60's feel to it as Nathan East sings the vocals with Clapton. Nathan has a way of bringing out the best of Clapton as they exchange licks. This CD is a must for any Clapton lover. 24 Night along with Dire Strait's "on the night" ranks up there with one of the best live albums, sure the continuity is a mess but it shows the versatility of a magnificent tour. The rendition of BADGE is the best I've heard, White Room is unleashed with fury and a scorching solo and the jamming on Sunshine....has to be heard to be believed. A slow but very expressive "Have you Ever.." gives way to a poignant solo and one of my favourite blues songs "Worried Life Blues" is given its best treatment. An extended Old Love takes your breath away as does a very beautiful "Wonderful tonight" top that off with haunting and powerful "Edge Of Darkness" and you have an album that is testament to the mans talent. This is a must-buy! I was into some real crappy music until I heard Eric's solo on the live version of White Room. I'd never even heard of cream or any other of Eric's stuff before. now I've done serious back tracking and a musical love affair has been born. There comes a time in every blues fans life when they need to hear those three little words, Eric Clapton- Live. The very thought of hearing Slowhand do his stuff is enough to inspire any man or woman for that matter. Recorded at the Albert Hall over the Christmas and New Year of ’90- ‘91, Clapton displays not so much an arrogance but supreme confidence during his first live event since the tragic death of his son, Conor. The blues nights see E.C. with a typically scrunched complexion as he bends his way through six nights of twelve-bar magic. With the addition of Robert Cray and Buddy Guy to the band, Clapton slides effortlessly into what he knows and loves best. Laments such as “Worried Life Blues” and the more upbeat arrangement of Guy’s “Watch Yourself” show Clapton’s qualifications as a Doctor of the Blues. Moving on to the four-piece band of E.C. (Guitar & Vox), Nathan East (Bass), Greg Philliganes (Keyboards) and Steve Ferrone (Drums); three bars into it you can hear that this band has the power to, “…turn a certain goat fluid into a petroleum based substitute” (paraphrased for our younger readers). This is clearly demonstrated in a spectacular re-work of the Cream classic, “White Room” and a thunderous nine minutes of “Sunshine of Your Love” leaving the capacity audience pulling their jaws from the floor for some time after. An equally good “Running on Faith” broke, no, shifted the mood for what was to come later in the tour program. Another five musical genii were ushered in to accompany the resident four to revel in some nine-piece frivolity, which doubled effectively as a re-visit to the “Journeyman” Tour of ’89 with songs like “Bad Love” and “Pretending” polished off with a haunting “Wonderful Tonight” and, (are you ready for this?) a thirteen minute epic re-run of “Old Love” co-written by Clapton and the aforementioned Mr. Cray, gave Clapton a chance to show off his menagerie of musical mannerisms. Finally to top it off, Eric does a bit with the National Philharmonic, conducted by Michael Kamen. 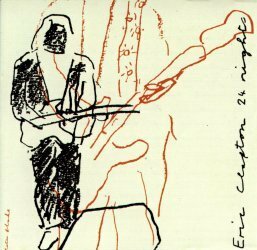 “Bell Bottom Blues” and “Edge of Darkness” (written by Clapton and Kamen) show that Eric is equally at home with both major and minor scales, although, never being one to hide his roots, he slips in the odd blue note to keep the blues die-hards content. Overall I have to say that this is the best live release I have ever heard, credit is due to Russ Titleman, Clapton’s long time producer and the Albert Hall for capturing the formality and the affable qualities of such a legendary musician. As for those three little words…I can’t wait to hear them again. In the Eighties, signing for Warner Brothers, Clapton agreed to record a double live album. These sessions were taking place at The Royal Albert Hall in London in 1990. Eric put together a four-piece band, playing the rock hits, such as Sunshine of Your Love and White Room, a nine-piece band, doing some more rock and pop hits, a blues-band, with a impressive guest list, Buddy Guy among others. There was also some sessions with a full symphony-orchestra! When all shows had been performed, Eric together with producer Russ Titelman, decided that the playing did not reach the standard of a Clapton release. So in 1991 Eric returned to RAH to do it all over. Albert Hall had been "Eric Hall", people joked! The first disc is based on the four-piece band and the blues band. While the four-piece band performing the Cream-songs Badge, Sunshine of Your Love and White Room. All of them very well done, and Eric throws in some notes of the intro for Hendrix's Purple Haze at the end of Sunshine! Of course Eric has to promote his latest studio-release, "Journeyman", and Running On Faith is very good, not as good as the "Unplugged" - version a couple of years later, but at least as good as the studio-version. The blues band does some standard blues tunes that always has followed Clapton through his career Watch Yourself, Worried Life Blues, Hoodoo Man and Have You Ever Loved A Woman. The latter might just be the best song of entire album! The song has been featured on many Clapton-albums before, but this is my favorite version. A slow, quiet version with fantastic vocals and superb guitar-performance! The intro starts out quiet, as the whole song, and suddenly during the solos, the song explodes! I can't do anything else than recommend it to everybody, Clapton sure knows how to bring life to a slow blues... The second disc is based on the nine-piece band and the orchestra. Nine piece band on performs some "Journeyman" - songs: Pretending, Bad Love and Old Love. Included also is the "Slowhand" - classic Wonderful Tonight. This version beats out every, single version I have heard so far! EC sings it very well, nice solo, great keyboards and Katie Kissoon does a wonderful job, transforming her voice to an instrument! Orchestra part has the Ray Charles-song, also featured on "Journeyman", Hard Times and the Dominos' classic Bell Bottom Blues. Both performed with perfection. The final track is one of the highlights, the instrumental Edge of Darkness. As you've probably understood, I like this record a lot. It's more than a live album acting as a greatest hits-package. Eric's in top-form, just sit back and enjoy the ride! I bought 24 nights about 5 years ago. This was the first live EC show I had seen, I was amazed, how good the solo's were and the singing. This made me appreciate EC and his live music, I was a massive Clapton fan, after watching it only once. The 4 piece nights are great.....the Blues nights wow, Have you ever loved a Woman is one of the best blues performances I have ever heard. There are also 9 piece nights and orchestra nights, all of the great EC standard. Bell Bottom Blues is fantastic with the Orchestra and "Edge Of Darkness" blows me away, what power. A must for any EC fan, live music at its best.